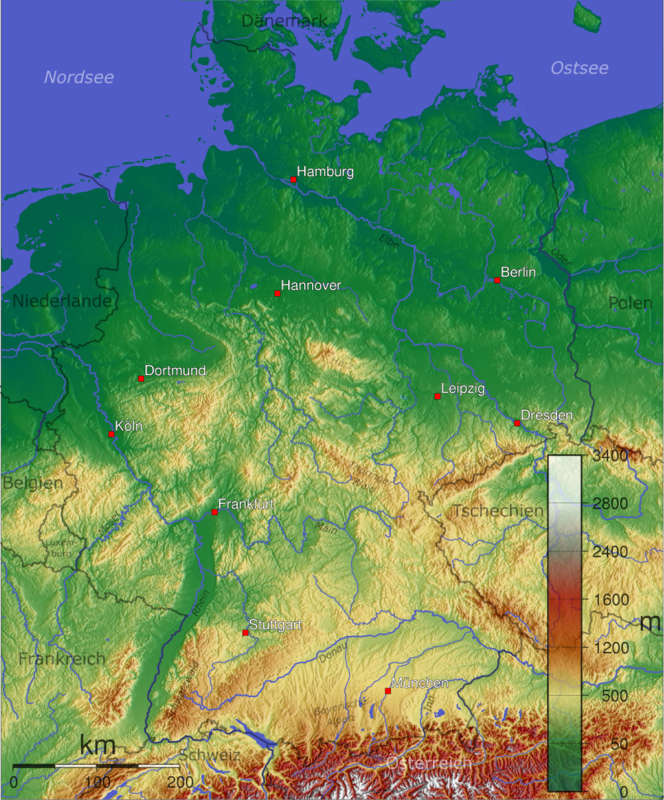 Germany* (jûr m -n ), n. a country in north central Europe, on the North and Baltic Seas; area, 182,471 sq. mi. ; pop., 65,899,000 (1946): in 1945, Germany was divided into four zones of occupation, administered respectively by France, Great Britain, the Soviet Union, and the United States, in 1949, the United States, British, and French zones were constituted as (the Federal Republic of) West Germany and the Soviet zone was constituted as the East German Democratic Republic (East Germany): capitals, Bonn (West Germany), Berlin (East Germany): German name, Deutshland: abbreviated Ger., G.
What is it that defines a place? Its borders? The way it is placed in our collective memory, in our history books? How is that a place comes to conjure certain emotions? What about the way in which people use the land? What about the personalities, values and passions of the people that live there? How do these people’s way of life embed the place with meaning? The study of geography fascinates me because of all these questions. When people move thousands of miles from their native land, why do they often choose places with similar topographic features or climate? How do their bodies or souls gravitate there? How do they know where to go—to the place that feels most like where they come from, the home they left behind? And how does what humans do in a given space define it permanently? Although my last name is Irish and my mother’s side is mostly Acadian French, a good chunk of my ancestry is German. And I remember when I found this out not wanting this to be the case. I had learned about the Holocaust and was horrified by the stories I read, the black and white photos I saw. I remembered the image that Elie Wiesel wrote of in Night that described babies being thrown up in the air and speared by German soldiers bayonets. And I wanted to not be from there, from the place that produced ethnic genocide, suffering, death, pain. I wanted to not be associated with or related to people who were able to participate in the mass slaughter, in a very methodical and personal way, of millions of people solely because of the God they worshipped and the way their features were shaped. In knowing that my ancestors came from there, even if it was long before the Holocaust, it somehow made them and me complicit or related to these unimaginable actions, this behavior so divorced from the human capacity for compassion, understanding, kindness. So I found pride in my Irish roots, my Cajun roots, and I ignored my German ones. And I wonder how we untether a place from its history. We can’t, I guess. And we shouldn’t. But what if a place only becomes about the painful parts of its history? I grew up in the South, in Louisiana—a place lush with cypress and magnolia trees, with humidity, with music streaming out of bars and out of the bells of brass instruments. This is also a place with long ugly celloid scars from the scourge of slavery and the racism that followed (and continues to follow) long after the Civil War was over. And yet it is my home. There are so many things about my home that I am proud of. I see that it is not one thing or the other, not evil or good, not about suffering nor about the overcoming of it. This place, as with all places, is defined by it all. I also don’t know how to reconcile the fact that the suffering of a place and its peoples also shapes and informs the important and positive cultural identification of that place. Before Katrina, New Orleans was 65 percent African-American, and it is the spirit, music, family and cultural values of the African-American community that is the foundation of the streets we walk on back home. Without this community, New Orleans is not New Orleans. And this community is there because their ancestors were brought over to be slaves to white colonizers. Germany is not just the Holocaust, but the scars are there. And the scars are visible not only to Germans but to me and the rest of the world. When I went to Germany on a high school trip to Europe, we went to two places. We walked around the cobblestones streets of Munich, where we visited the Hofbräuhaus and watched the Glockenspiel tell the hour in the evening. And yet all the time, I was thinking of the next place we were to visit: Dachau. It was raining and cold when we visited Dachau. We walked around and saw the empty plots, with wooden borders to show where the camps had been. We saw one of the brick ovens (a reconstructed one? A remaining one? I don’t remember now). At some point, I distanced myself from the crowd and went with my umbrella to stand off alone taking in the scene. I remember thinking: This is where the Jews were persecuted. This is where they stood in rain and cold like this except with threadbare clothing and shaven heads. And I wanted more than anything to cry. But I couldn’t cry. The truth was that I could not feel their pain. How could I? I had never had to experience the sort of suffering they had undergone. So all I could do was stand there and try to understand. I have had a hard time writing this post because whenever I thought of Germany, these thoughts came to my mind. And I thought, is that all there is to write about? I guess that’s not what matters because this is what, I suppose, I needed to write about. That my Grandma’s name is Rothermich. That my great grandfather’s name was Hupfer. And that it is problematic to come from a place—from multiple places—in which human beings were impossibly cruel to other human beings. The key to understanding a place, I suppose, resides in the ability to not only read or understand but absorb the feeling of it all as much as possible. To see the broken down barns as well as the stately mansions, the dead trees and the ones that bear fruit. I guess it is about never forgetting the human-created sorrow that will never be absent from the place and yet to not allow that feeling of sadness to be the only feeling. To know a place, in my mind, is to know that it is a space in which both hurt and healing can occur. What happens in that space, all of it, should never be forgotten. And our responsibility to that place is to try to tip the scales, to be better to each other than future generations were and to repeat their kindness but not their cruelty.